-theme (holly - my leaf is from Paper Smooches Christmas Words 2 dies and the berries are from the Poinsettia set). -gold sentiment (Christmas is also from the Christmas Words 2 set, greetings is from Metropolis). -layout (I kept the white panel slightly longer so that the black cardbase only shows at the sides). -bling (Ingrid used Gold ep and sequins, and I used inlaid foil cardstock). It was fun to use foil cardstock to get some real shine and colour, but man, it's hard to photograph! I'm also linking up to the current Paper Smooches Sparks challenge as well as Less Is More, where the recipe is 'Something Shiny'. ETA - Oct 9 - this card was Showcased at LIM! Anyway, I hope you'll join us - we are now less than 3 months away from the big day, people! The deadline for this challenge is Wednesday morning at 8 am EDT. At that time you can vote for your 3 favourites until Thursday at 8 am. Voting results will be posted on Thursday at noon. Love the shine! I think you did a great capturing the shine in the photo...tricky business! The PS sentiments are always so much fun. Loving the Metropolis "greeting" too. I really like the inlaid die cutting on this card - it is perfectly executed! FAB make and it sure IS shiny! Ardyth, always appreciate your inspiration! This is a real stunner Ardyth! What a wonderful card, it is so lovely!!! 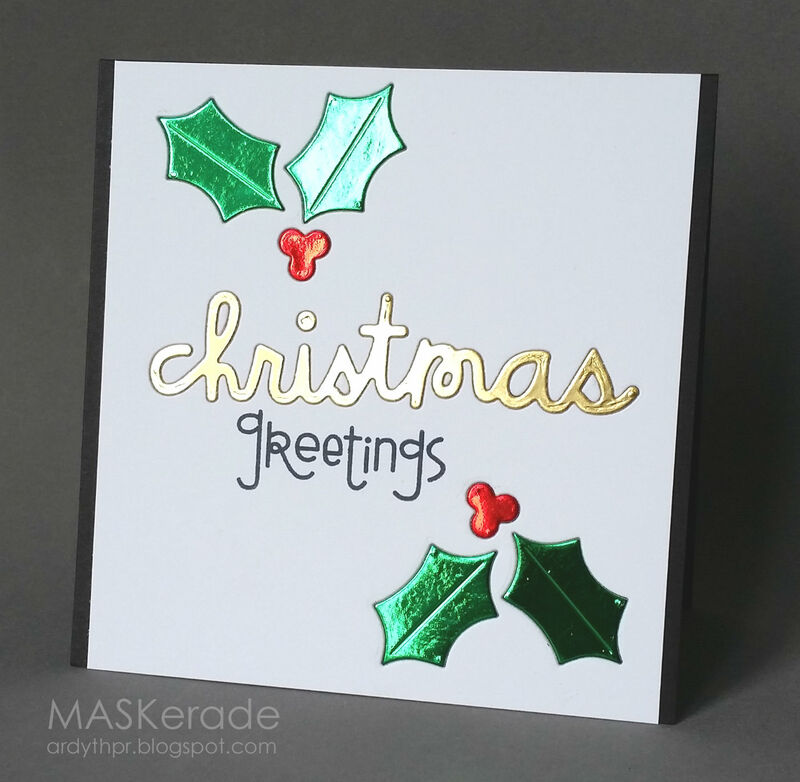 Just love those super shiny die cuts Ardyth... really looks like Christmas! Absolutely love your cards ALWAYS Ardyth! Totally inspiring and this is just AWESOME! 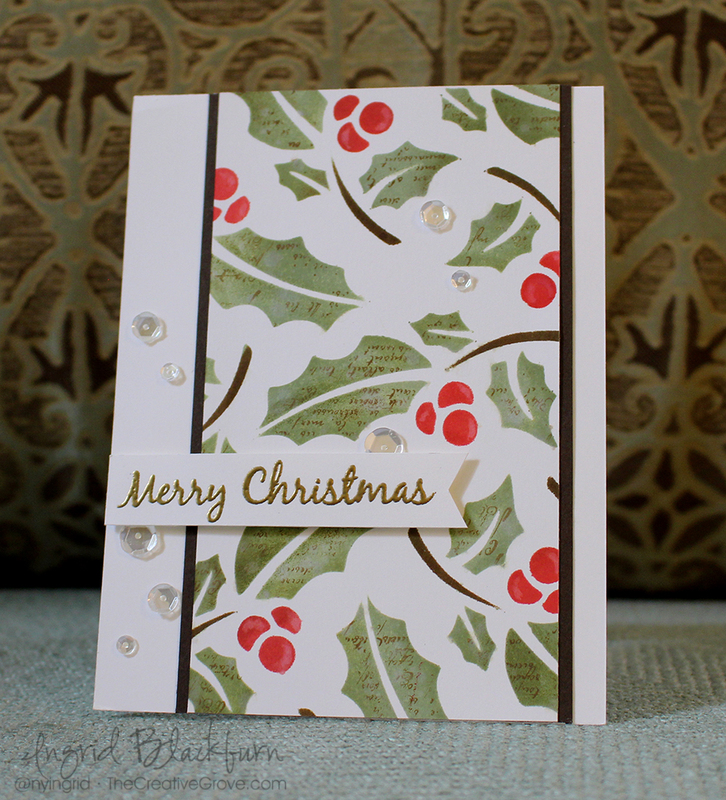 Love the inlaid die-cuts and shiny holly leaves and berries work so perfectly this week. thanks so much for sharing and taking part. Beautifully done, Ardyth! Love that you were able to photo the "shiny"! I really like that "Christmas" die too! Super bit of festive shine Ardyth! Love your fun, glossy inlaid die cuts, Ardyth. Such a clean and crisp card, great black verical borders. I'm with you on the photography, not easy is it?! 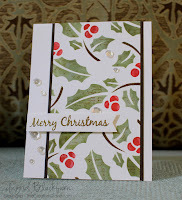 I love this card and the look of the inlaid die cuts is to die for!